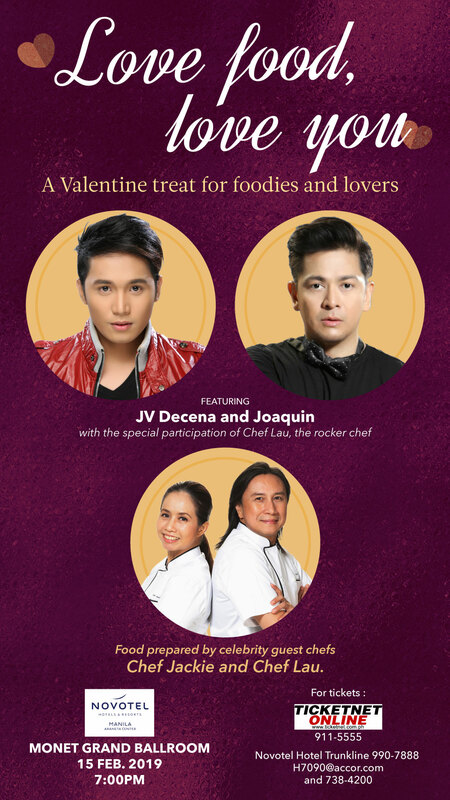 On February 15, 2019, celebrate Valentine’s Day at Novotel Manila Araneta Center with your loved ones and enjoy great food and feel good music from world-class chefs and artists. Let JV DECENA and JOAQUIN sing the songs of your life while enjoying the sumptuous meal prepared by the culinary duo, CHEF LAU AND JACKIE LAUDICO. LOVE FOOD, LOVE YOU a valentine treat for foodies and lovers on February 15 at NOVOTEL Manila Araneta Center…see you there!